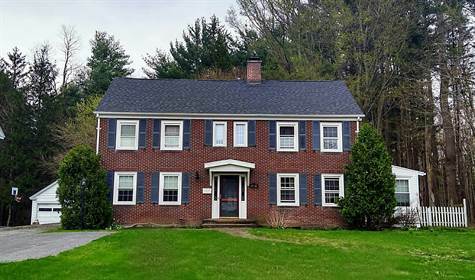 Homes for Sale in Pulaski, New York $175,000 1st Carriage House Realty, Inc.
Beautiful 4 bedroom 1 1/2 bath original colonial on a large village lot. This home welcomes you with a cozy entry with built in bench and foyer with a grand staircase. There are original hardwood floors and woodwork throughout, a wood fireplace, built-in book shelf and china cabinet, and a large sun room. The master bedroom features a large built in custom closet including a shoe closet and another bedroom has a natural cedar closet. Relax and enjoy the private fully fenced back yard on the deck or new patio. The roof is new and the windows were recently replaced. The 1 car garage, shed, and full attic and basement offer plenty of storage options. From Pulaski head north on US Rt 11 / N Jefferson St. Property will be on the right.